RM-5TI is end of life (EOL). 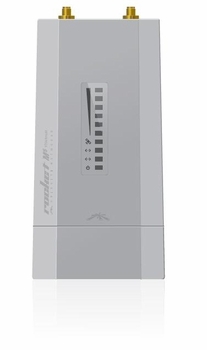 Ubiquiti recommends RP-5AC-Gen2 for functional replacement. The RocketM Titanium is the most powerful airMAX BaseStation to date. It features 802.3af compliant PoE (Power over Ethernet), gigabit Ethernet, a GPS receiver, advanced RF shielding, and a faster processor that can provide up to a 20% increase in performance. The RocketM Titanium features enhanced radio perfomance and superior durability. Its carrier-class capabilities link distances up to 50+ km and provide breakthrough speeds of up to 150+ Mbps. The RocketM Titanium takes advantage of its Gigabit Ethernet connection to deliver high throughput for reliable data transfers. The RocketM Titanium enclosure was specifically designed to improve performance in harsh RF environments and in extreme weather conditions. 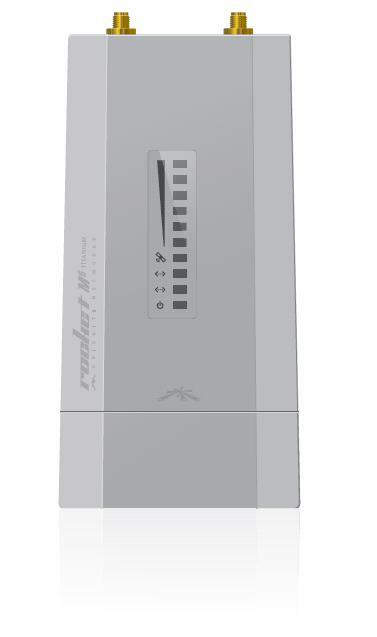 Enclosed in aircraft-grade aluminum, the RocketM Titanium is a rugged, high-power, linear 2x2 MIMO radio. • GPS Synchronization: RocketM5 Titanium has integrated Ubiquiti airSync™ technology. • 2x2 MIMO: Hi-power, linear 2x2 MIMO radios with enhanced receiver performance.